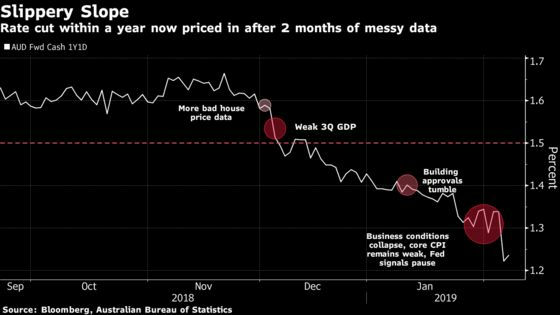 (Bloomberg) -- Australia’s central bank cut growth and inflation forecasts in response to weaker consumption as it assesses how slumping property prices could reverberate across the economy. In its quarterly update of forecasts, the Reserve Bank of Australia drilled deeply into factors impacting the outlook amid a darkening picture at home and abroad. Economic growth in the year to June 2019 was cut to 2.5 percent from 3.25 percent and by half a percentage point in the following 12 months, according to the Statement on Monetary Policy released in Sydney Friday. The Australian dollar fell, buying 70.66 U.S. cents at 12:46 p.m. in Sydney, compared with 70.95 cents before the report. Traders ramped up bets on an interest-rate cut by November, with futures data now showing a better than 90 percent chance. Governor Philip Lowe this week abandoned a policy tightening bias and instead sees the chances of an interest-rate cut or a hike as “more evenly balanced.” While the jobs market remains a source of strength, a slew of weaker data in the past two months -- mainly connected to the deteriorating housing market -- forced the RBA to adjust its stance. The RBA was taken aback by the statistics bureau’s recent downward revision of consumption growth for the past three years, and as a result “the starting point for GDP growth forecasts is three-quarters of a percentage point lower than previously expected.” It now predicts consumption growth to be 2.75 percent over the forecast period rather than the 3 percent earlier estimated. Still, the central bank is persisting in its view that a stronger labor market will eventually lead to faster wage growth and a pickup in inflation to within the 2 to 3 percent target range. That’s been the thinking behind keeping the cash rate steady at a record-low 1.5 percent for 2-1/2 years. The forecasts show core inflation reaching 2 percent at the end of this year and headline inflation reaching there in mid-2020. Headline inflation is predicted to slump to 1.25 percent in the year through June this year due to lower oil prices. The central bank estimated that a sustained 15 percent fall in oil prices would cut about half a point from CPI and could “cumulatively” lower core inflation by a quarter point through indirect effects over two to three years. Friday’s statement contained the usual forecasts for growth, inflation and unemployment -- seen falling to 4.75 percent in December 2020; but it also contained a separate sheet of more detailed forecasts on everything from household consumption to wages to public demand.